The film American Splendor is about a famous comic book series and the author, Harvey Pekar, the film goes into detail how Harvey started at the very bottom an worked his way into creating a very popular comic series. Harvey’s wife doesn’t come into action for sometime but one she, she is a absolutely crucial for their relationship and in other words plays a major role in the film. There is a multitude of different concepts from Scott McClouds novel Understanding Comics scattered throughout the film. The main character of the movie is named Harvey and is a very gloomy, irritated, depressed man. He is struggling to stay up on his feet through various jobs and the fact that he could never figure out how to write a solid comic. One of the first concepts that stood out to me relating back to McClouds novel was that any story can become a comic. Harvey started out struggling to come up with a story for his comics but eventually learned that just by writing about stories that happens in his everyday life. Harvey later brought his stories to his friend who was making a living from creating and drawing comics and he thought Harvey’s stories weren’t so bad. Leading me into my next concept that related to the movie, a quote from the novel by Scott McCloud says that “No schools of art are banished by our definition, no philosophies, no movement, no way of seeing are out of bounds”. Though this concept ties with my first it made me believe that the film was created the way it was because Harvey and his character is a very non tradition guy, meaning he doesn’t follow the guidelines of creating your average comic. Yes, any story can become a comic but the way the comic is presented can be a turning for its audience. Another detailed concept that stood out to me was how in the film there would be scenes including time stamps in the corners of the screen. This on the other hand was a bit more of a traditional idea presented in comics to help the audience have a better understanding of whats happening at that moment in time. I personally did not use this idea in my own comic but have read several other comic that do include this concept. This is also not the first time I have seen films do this sort of time stamp, it’s actually used quite commonly in all sorts of movies, novels, and or even presentations. In chapter 3 of Scotts McClouds novel it talks about all different kinds of scenes that can be done in order to draw out dramatic affect. The film actually does this quite a bit with all sorts of different angles to create affect as do comics. What was also unique was that this film added speech bubbles and other comic-like drawings into the film giving the audience a bit more of detail on what the story may really be about. To me when I began noticing that the movie had been adding these extra features making it seem as if the story really was about a superhero named Harvey and how hard it was for him but eventually he is recognized. In the beginning of the film there is a Halloween scene that truly helped my theory. 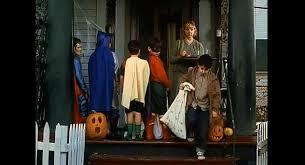 In the scene there is a group of boys all dressed as super hero’s except one who was Harvey Pekar. In this image we can see the Halloween scene of the film. Young boys dressed as super hero’s and then there is Harvey Pekar.